The return of the snow! With winter returning in spectacular style to Scotland this week crystal planting plans have gone up in the air as its difficult to even reach the main road here at the moment other than on foot. However it feels good to be able to help the birds, small mammals and other wildlife as the cold weather sets in with the snow quartz cairn in the garden and using snow quartz in the several drinking stations we have for the birds here. Tonight's Crystal Earth Meditation, 24th November 2010, is a continuation of our work to help bees across the planet. The crystal focus for this meditation will be a Pure Strength Set combined with amber. Please use the image below as a positive focus and thank you for joining us. A big thank you to those who sent in records for crystal plantings for Universal Children's day. My youngest daughter asked to join in and chose to plant celestite next to the standing stone in our garden - thank you Ellen! The United Nations' (UN) Universal Children's Day, was established in 1954 and is celebrated on November 20th each year to promote international togetherness and awareness among children worldwide as well as to act as a platform to promote their well being. In celebration of this event, this year, we are encouraging as many people as possible to plant a crystal to help children across the globe, tomorrow 20th November 2010. Simply take a rose quartz or celestite crystal of any size or shape - it can be rough cut or tumbled. Rinse it in running water to cleanse and pat dry with a clean white cotton cloth or similar. Hold it in your right palm and ask that it be charged to bring peace (rose quartz) or angelic help (celestite) to the children of the Earth. Then simply plant it to where you feel drawn by digging a hole and burying it, placing it under a stone or in a crack in a wall or in paving where it wont be disturbed. It may be planted to a place of beauty, a place of need or a place directly connected to children - school, playground, home, refuge - trust your intuition. Thank you for taking part in this simple, yet powerful act and for helping children across the globe. This work is part of 'The Grace Project' which is the branch of the Crystal Earthworks responsible for developing crystal planting work in direct connection with children. This meditation is in light of the continued cholera epidemic to this region and the current disruption to aid relief. Hope you can join us in helping those in great need. build a world free of all forms of violence. I felt prompted to review the past eight years, on this, the projects eighth birthday and it feels lovely to share with you all, how much has been achieved. My own crystal planting work began in earnest in 1999 and continued into the summer of 2002. At that point, the coming together of 12 light workers for a course purely focused on crystal planting revealed that the seeds that I and others had already sown were to be a part of something much bigger than we had previously been aware of and with potential to bring great healing to our energy challenged planet. and her inhabitants. From that initial coming together and the birthing of the Crystal Earthworks with its website through 11am on the 11th November 2002, much has been achieved. The first three years focused on introductory talks, courses, the provision of programmed crystals for planting for specific healing purposes, developing the website and the beginning of monthly crystal meditations for community and planetary healing. The website and leaflets written to accompany and guide the planting of the programmed crystals led to the offer of a publishing contract for the project for a book about crystal planting. Our first community crystal planting projects also began during this period. A move to the North Yorkshire Moors followed, which provided many and varied healing opportunities and an inspiring location in which to write and work on the book. It was also during this time that two whole new bodies of planting work evolved with the birthing of the Aura Crystals for planting and the Pure Grace Hearts. The first seeds of work with children were sown, opportunities for introductory talks led to newspaper and magazine articles and this blog was started to inform and inspire a wider audience of the work being undertaken by the project and its healing potential. Crystal Earth Meditations expanded to take place every two weeks. Five years later the project is now based in Orkney, the book is in its final stages, meditations are held weekly and the refining and development of the project as a whole continues. Most importantly over the last eight years hundreds of records of crystal plantings have been sent in by a growing number of enthusiastic crystal planters. It is both humbling and inspiring to be able to say that the world is a far brighter place for all these plantings and the cleansing, healing and re-balancing these crystals continue to bring to the earth and her inhabitants. I would like to take this opportunity to thank from my heart all those who have planted one, several or many crystals over the last eight years. Without you action, encouragement and support the project would not exist and the increasingly challenging times we and our beautiful planet all face would be of even greater severity and unrest. - When a person has a vision they are often described as a fool. - If two of more share the same vision, they are said to be misguided. - When 10 or more come together to empower the vision it is called a cult. - When 100 enact a vision it is called a movement. - When 1000 join the movement it is called a REVOLUTION. As the Crystal Earthworks grows I pray that one day it will be a revolution bringing peace, healing and the strength of heart to all. 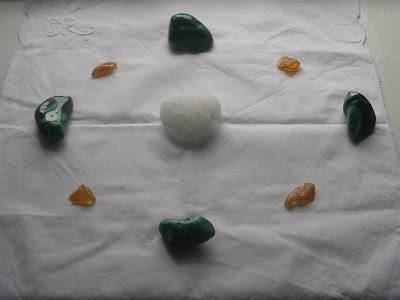 Today we are celebrating the eighth birthday of The Crystal Earthworks. There will be a meditation through 11am GMT with the crystal configuration shown below as the focus. We hope you can join us on this special day! 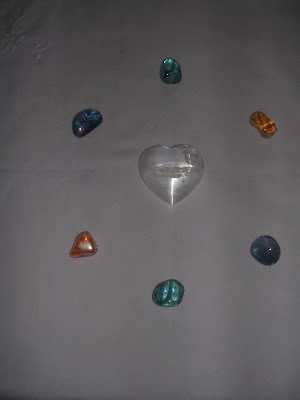 This meditation will use a Pure Grace Heart in connection with rose quartz and celestite, please use the image of rose quartz below as a focus. Hope you like the new look blog, redesigned last night in preparation for the projects eighth birthday tomorrow. Details of our special birthday meditation through 11am and a review of the last eight years will be posted tomorrow morning. The cluster map has also undergone its yearly archiving so it will be lovely to see how interest spreads across the globe again in the year to come. Many apologies to all those of you who access the blog or website to check on the focus for the Crystal Earth Meditations. Unfortunately the Internet was down here yesterday so I couldn't update things. 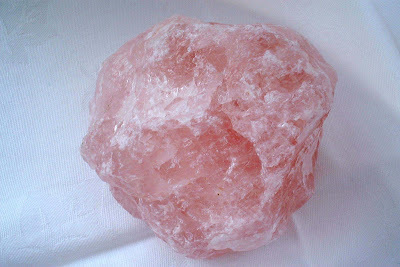 We did hold a meditation to send 'Peace and healing to the Earth and her inhabitants' using rose quartz. If you would like to receive a weekly text re the meditation focuses please simply email your mobile number and I will add you to the list.